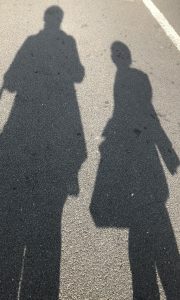 While on a sunny school run my daughter felt compelled to stamp on my shadow. I instantly moved away and a little game began. We started to step on each other’s shadows and the game suddenly became intense and very personal. I could feel it in my body. In a split moment, I had a realisation. This is just my shadow. Its the outline of my reflection from the sun. It’s not me. And I began to relax and it became a much more playful experience. She stamped on it and stamped on it as we both giggled. I then had a realisation that as much as the shadow is simply a reflection of the sun behind us, what about me? If I am the result of the illusion of the power of my personal thinking, then am I actually real? Does the outside world actually affect me – positively or negatively? While I am in that illusion – yes it does. And all the emotions and bodily sensations which come with this will be. Life as the majority of the world knows it and perceives as real. And while I exist outside of my personal thinking and my mind is still, no it doesn’t. And from there, so many more options become available. We are not our stories, or what we “believe/think” we are. We are the dance between it all. We are that and way way more.